How Can Tacomans Save The Helm From Closure? Today in Exit 133b, Daniel Blue, writer and occasional visitor to Frost Park, describes the imminent problems of The Helm gallery. A modest footprint on Broadway in Downtown Tacoma, The Helm requires between $1200 and $1300 a month to stay afloat. This is not including the 200+ man-hours Peter and Sean split rather erratically between them. For the past three months the gallery has sold next to nothing. A distressing development as The Helm has been used for some great shows and is a place for artists to gain some visibility at a relatively low cost. Blue and RR Anderson have both had shows at The Helm. Below is a combined show at The Helm. RR Anderson later had a full fledged show there at the Tacomic Anniversary. An typical scene at The Helm. Using the Tacoma Dome as an icon, Sean has created a 18“x24” poster of which he will only make 300 prints. They are for sale for a limited time at the extremely reasonable price of $50 per piece. If the plan works perfectly, The Helm will be able to take in $5000 to cover some expense and keep the gallery afloat for awhile. Perhaps even long enough for the Frost Park Chalk Off blowout show and party. While shrouded in mystery and misunderstanding, the prophets are always marginalized, but the Helm has kept a faithful if somewhat irresponsible following since its grand opening last year. For the past three months the gallery has sold next to nothing. That means that the gallery stayed open because Peter has paid the rent himself. As endearing as the efforts no doubt are, The Helm is going to have to look at different ways to bring in revenue and seek all the help they can from other gallery consultants possible. They need some new ideas. How can The Helm be saved and still retain its accessibility for artists long term? Are both possible? I really do enjoy going to the shows at the helm but indeed I am one of those people that have not bought a single item from that gallery. I really want to but art its expensive and its hard to justify for me personally to shell out for something that I really can't afford. I respect peter and sean so much because they don't bs, when asked how they are doing they are straight up about their problems with the place. How do you turn this place profitable, I'm not sure. I do know that creating posters every few months to "save the helm" is not good on their sanity and will not workout in the longrun. I do know they have recently been having a few music shows there but this is definitely not a money maker since there is no bar for additional revenue. The only way I see the helm staying around is, to create some sort of merch store, maybe turn into a store in the front/gallery in the back area...some sort of multiple revenue stream is needed. 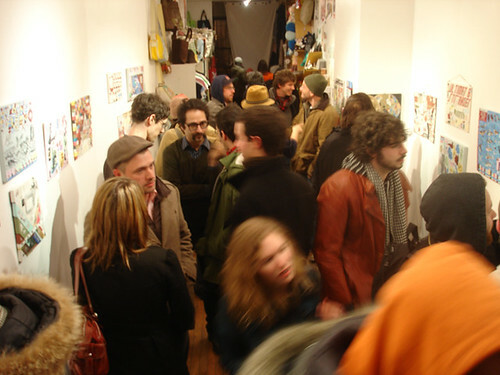 Or possible create some sort of membership program for artists to show their work there. For example become a consulting/marketing platform for artists. ok thats enough thought from me for now. by Erik on 6/27/2008 @ 9:54am The only way I see the helm staying around is, to create some sort of merch store, maybe turn into a store in the front/gallery in the back area...some sort of multiple revenue stream is needed. Good idea. I think, they may be able to simply rent out the place occasionally for parties and catered events. The location is certainly good for it and there is a demand for affordable space. by fredo on 6/30/2008 @ 8:12pm A couple of ideas: Expresso coffee stand, maybe an offsale license to sell beer and wine. Also even if the lease is inexpensive, try to reneogiate it. The commercial market is soft now so I doubt if the owner wants it back on the market. The real problem as IT seems to suggest is that the market for art is pretty porous. Even people in the upper income backets are clipping coupons. Final idea: maybe this art could be offered through feedtacoma shops. I think a lot of people would like to own one of RRs cartoons. by deeble interactive on 6/30/2008 @ 8:36pm Numbskull hear that .... er .. . I mean rumors I've heard and the general consensus among gallery owners I am intimate with all point to the friday frost park chalk art as the ultimate downfall of the small time art venues in Tacoma. Why the heck should people pay for art when they can get dynamic art for free literally beneath their feet WEEKLY? craigslist killed newspaper classifieds just as frost park is killing contemporary art galleries. by AngelaJossy on 6/30/2008 @ 10:28pm Isn't that a bit like saying radio play killed record sales? The artists that draw in Frost Park are probably more recognized now then ever before. If properly parlayed, that could mean they sell more art than ever before. Its free publicity. You can't take home a slab of Frost Park pavement though many have threatened to. by deeble interactive on 6/30/2008 @ 11:16pm while true the artist get more recognition and maybe more art sales, but how do the gallery owners get their cut? the street performance community art gatherings might be cute, but where is the taxable revenue? And why pray tell is the helm so special? Who is helping to save the Thomas Kinkade gallery in the mall? by Erik on 7/1/2008 @ 12:34am And why pray tell is the helm so special? Its special because its an intermediate step for artists to have a shot from going from hobbyist to the big time. It only costs around $100 to rent the place. Without places like The Helm, one has to try to jump to one of the big venues all at once. I would not worry too much about them, the Mall is expanding and will take care of them nicely. by NineInchNachos on 7/1/2008 @ 9:09am for more exciting information on how the MALL culture is destroying amercia check out the latest installment of RADIO LAB! by thriceallamerican on 7/1/2008 @ 9:44am Wait, are we seriously treating "deeble interactive" as anything more than one of RR's bizarre sock puppets? by droid116 on 7/1/2008 @ 10:04am I want the "deeble interactive" to start their own blog. And anyway, aren't we all sock puppets? That is possibly the stupidest thing I have every read. by NineInchNachos on 7/1/2008 @ 10:14am I am not responsible for anything that asshat says. Deeble is a bane to my existence. I was told .."Don't take this the wrong way, but you do realize that yuppies are kind of right in your market, right? I mean, I would love to buy your stuff but since I'm not a yuppie I don't have discretionary dollars to spend on things other than food, gas, and the kids. I would think you would be embracing the Mecca condo crowd.The downtown arts scene and yuppies go together like....cash registers and money. Don't bite the hand that feeds you, then claim it was someone else's......"
by a mama........who knows Tacoma. I wouldn't blame any of my many failures on lack of yuppies....I blame the fact that I'm ahead of the curve..as is the helm..I only think the helm should consider some kinda capitalism.....cold hard capitalism.....Ohh, that hurts....but the helm is the future.....just as those of us who have been dealing in vintage are only just now getting some respect......there are many great and wonderful things that happened in tacoma and happening now.....those with money have a moral and social obligation to spread the wealth.......much has been given to them....much is expected from them........Step Up Sugar Daddies and Mammas !!! !